Chances are you’ve been asked this question before, perhaps by a health professional, on a flight, or at a dinner party or restaurant. So, just what is an allergy? And how is it different from a food intolerance? The answer lies in the body’s immune system. Your immune system is evolved to defend you from invading organisms and harmful, foreign molecules e.g. bacteria or viruses. When these enter your body, they are recognised as ‘foreign’ by white blood cells, which triggers an immune response. This immune response involves inflammation, the recruitment of various immune cells and also the production of special molecules called ‘antibodies’. Antibodies are specially designed to bind and neutralise invading, foreign cells or molecules. Incidentally, this is how vaccines work. They stimulate your immune system to produce antibodies against a virus (e.g. measles) or bacteria (e.g. tetanus). In the case of an allergy, a normally harmless substance such as pollen, dust mites, shellfish, latex (collectively termed ‘allergens’) gets recognised as ‘foreign’ and triggers an excessive immune response. It is this inappropriate immune response that is the hallmark of an allergic reaction. What happens in the immune system during an allergic reaction? Brace yourselves, this might get quite complicated! In the most common type of allergy, the body produces a particular type of antibody called Immunoglobulin E (IgE). The first time you’re exposed to an allergen (e.g. nuts, shellfish, latex), your body undergoes a process called ‘sensitisation.’ During this sensitisation process, specialized immune cells called antigen presenting cells ‘capture’ proteins in the allergen and present it to other white blood cells. One type of these white blood cells, B cells, then produce IgE antibodies that are targeted against the allergen. 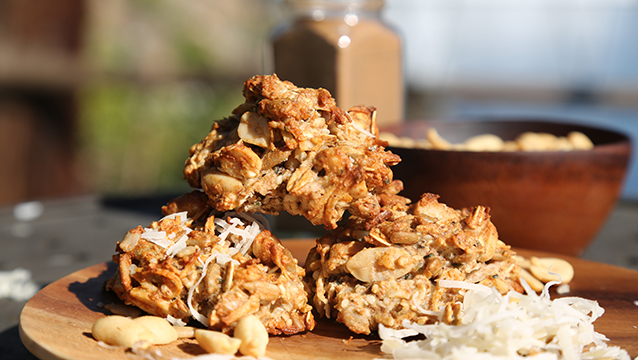 In the example of a nut allergy, it will be an antibody designed to bind to a specific protein found in nuts. If you were to look at an IgE antibody under an extremely powerful microscope, it would look like the capital “Y” letter. The top two ends (i.e. your hands, if you imagine doing the ‘Y’ from The Village People’s YMCA dance!) are the bits that bind to the allergen (e.g. the protein found in nuts). 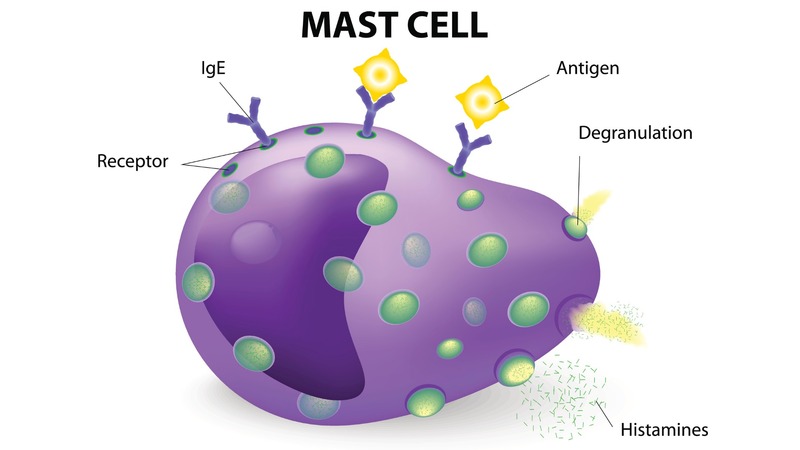 The bottom end (your feet in the YMCA dance), attaches to the surface of another type of immune cell, called mast cells. When someone is re-exposed to an allergen later in life (e.g. they eat nuts), they will already have lots of pre-formed IgE attached to mast cells circulating in their bloodstream. The free ends of the IgE antibody, which are targeted to the allergen (nut protein), then bind to the allergen. This activates the mast cell, causing it to rapidly release lots of inflammatory substances in a process called ‘degranulation’ (see Diagram below). One of these inflammatory substances is histamine, which causes itchiness and may lead to narrowing of airways and widening of blood vessels among other things. There also lots of other inflammatory molecules released, all of which give rise to a sudden allergic reaction. Note there are also other, typically slower, types of allergic reaction. These are also immune responses, but they involve different immune cells or antibodies other than IgE. Collectively, these types of allergic reactions are termed “Non-IgE mediated” allergic responses. Symptoms of allergy vary from mild to life-threatening. Allergic reactions that involve IgE occur immediately, often a few seconds or minutes after ingesting food. By contrast, non-IgE mediated allergies generally occur hours after eating a food. 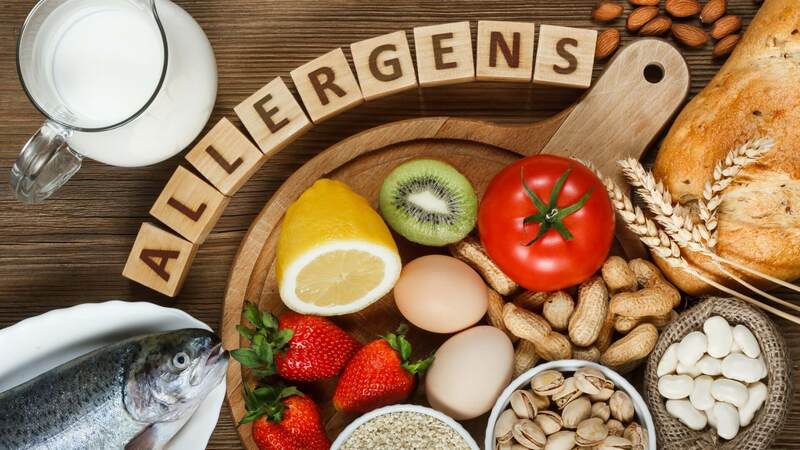 Food allergies can also cause anaphylaxis, which is a severe and potentially life-threatening reaction that involves wheezing, feeling light-headed, collapse and loss of consciousness. This is a medical emergency and immediate medical help should be sought in this scenario. How is an allergy different from a food intolerance? The distinguishing feature of a food allergy is that it involves an excessive immune response. In the case of IgE-mediated food allergies (the most common type of food allergy), this immune response involves the production of specific IgE antibodies that are targeted to the allergen and the activation of mast cells. Although the exact role of the immune system in food intolerance is a subject of scientific debate, food intolerances generally do not involve an excessive immune response. Unlike a food allergy, a food intolerance cannot cause anaphylactic shock. Symptoms of allergies, especially IgE-mediated food allergies, also tend to occur immediately after eating. By contrast, symptoms of food intolerance usually occur hours or even days after eating. Furthermore, some people with food intolerances can actually ingest a small quantity of the implicated food without any symptoms. For example, someone with an intolerance to dairy products may be able to eat a small amount of cheese without issue. By contrast, someone with a dairy allergy will experience an allergic reaction on exposure to minute amounts of dairy. As mentioned earlier, these symptoms tend to occur hours (or even days) after ingesting food. Can FitnessGenes tell me about food allergies? While genes do certainly influence someone’s susceptibility to develop a food allergy, it is impossible diagnose a food allergy based on analysis on someone’s DNA. For this reason, your FitnessGenes DNA results do not shed light on any food allergies. skin-prick testing – a small amount of the allergen (e.g. nut protein) is pierced into your skin to observe whether there is a rapid immune response – i.e. an allergic reaction. blood testing – a sample of blood is taken and tested for the presence of IgE antibodies specific to an allergen. 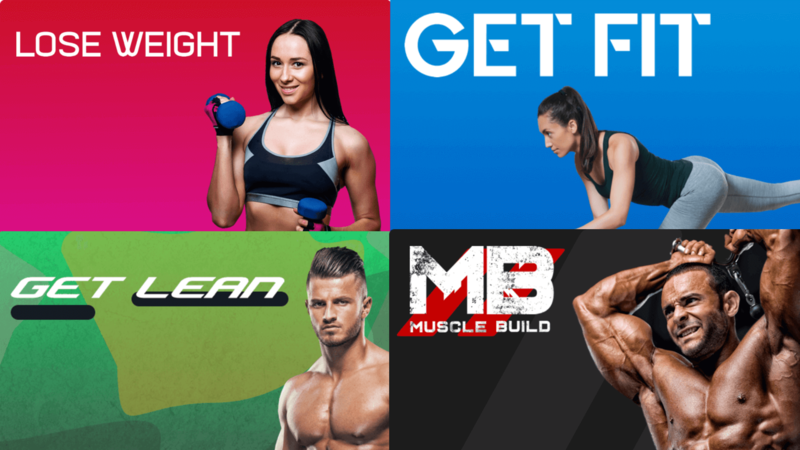 trial elimination diet – the suspected food (e.g. nuts) is removed completely from your diet for a period of 2-6 weeks. Symptoms may improve in this period. Afterwards, the food is reintroduced to see whether allergic symptoms reappear. Can FitnessGenes tell me about food intolerances? At FitnessGenes we tell you whether you’re likely to be genetically lactose intolerant. Lactose is the sugar found in dairy products (milk, cheese, yoghurt) and is broken down by an enzyme called lactase. Lactase is encoded by your LCT gene. As adults, most of us lose the ability to continue producing lactase (a phenomenon called lactase deficiency), and this partly due to a variant of the LCT gene. Nevertheless, tolerance to lactose is also influenced by factors other than your LCT gene, such as the make-up of your gut bacteria. Irrespective of your DNA results then, if you do not suffer any unpleasant symptoms (e.g. abdominal cramps, bloating), you should be OK to continue consuming dairy. Apart from lactose, there are no reliable genetic tests for wheat or gluten intolerance. Also, be aware that gluten intolerance is different from coeliac disease, which is an autoimmune condition. If you are concerned that you have a food intolerance, it is advisable to consult a dietitian or similar health professional. They may ask you to keep a food diary to better understand what foods are contributing to your symptoms.